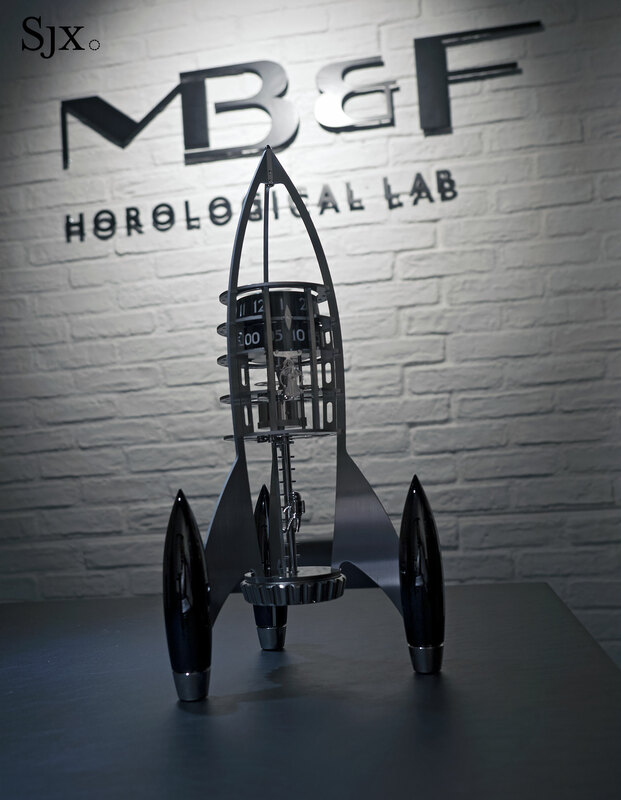 A spaceship-shaped timekeeper is the latest instalment in MB&F's collaboration with traditional clockmaker L'Epee 1839. 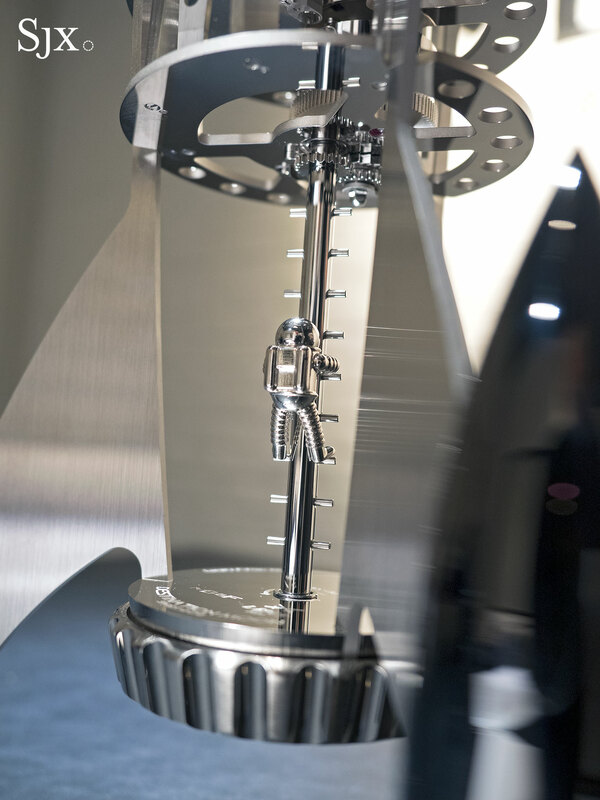 Named after its founder and year of founding, L’Epee 1839 mostly made traditional carriage clocks, rectangular mantelpiece timekeepers in 19th century style. 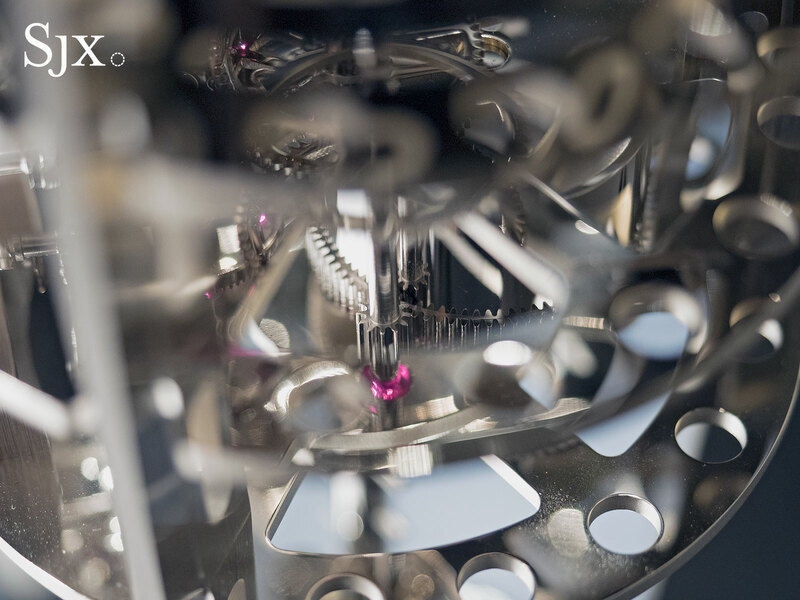 But its designs took a drastic departure for the contemporary when the clockmaker embarked on a collaboration with MB&F in 2014 that resulted in the Starfleet Machine. 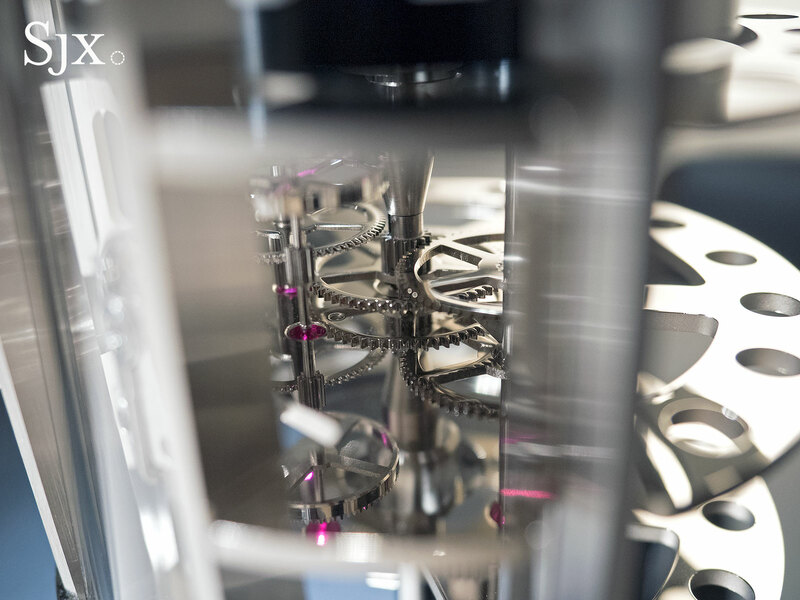 Since then the duo have built a successful franchise with a series of unusual clocks ranging from from robots to giant spiders. 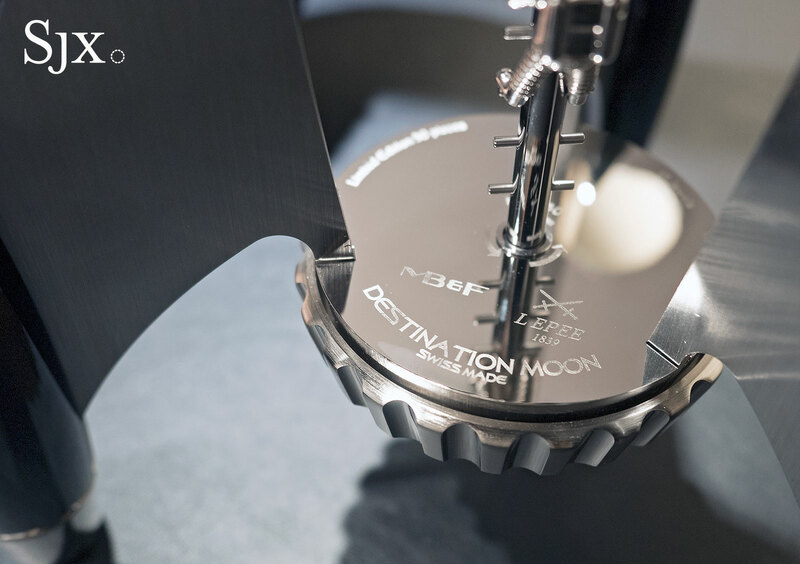 The latest result of the tie-up is the Destination Moon, a 40cm, 4kg rocket made of palladium-plated brass and stainless steel which will run for eight days on a full wind. 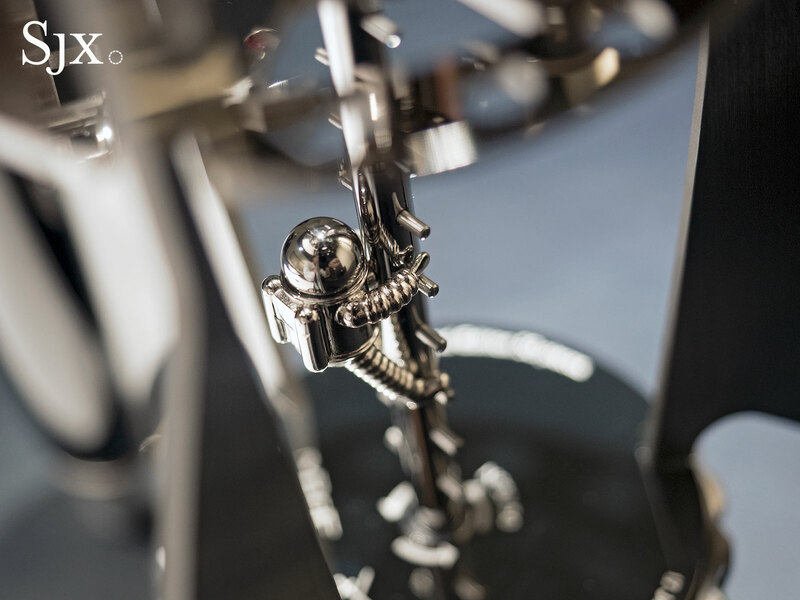 While the old school L’Epee 1839 clocks are suited to a setting heavy on gold leaf and marble, the Destination Moon, or any of the MB&F collabs for that matter, is modern and has a sense of humour. 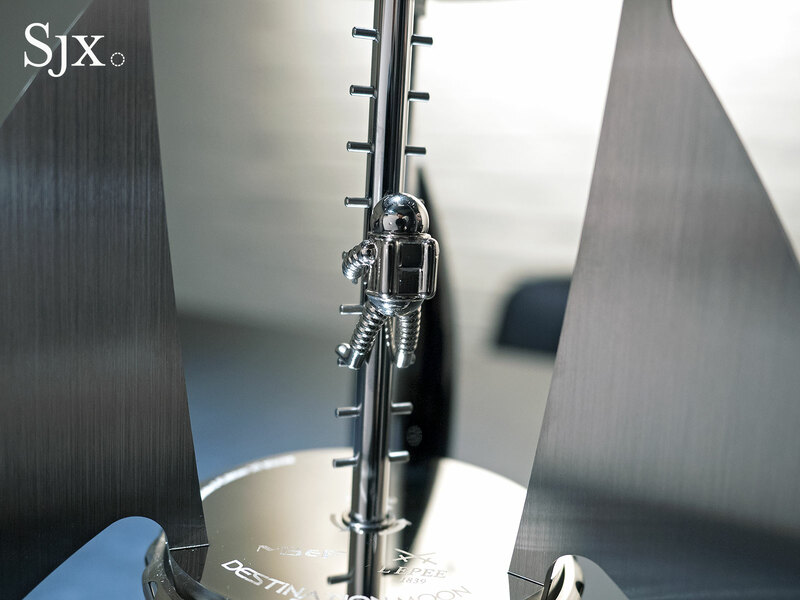 It even comes with a little magnetic astronaut figurine named Neil – but without a Speedmaster. 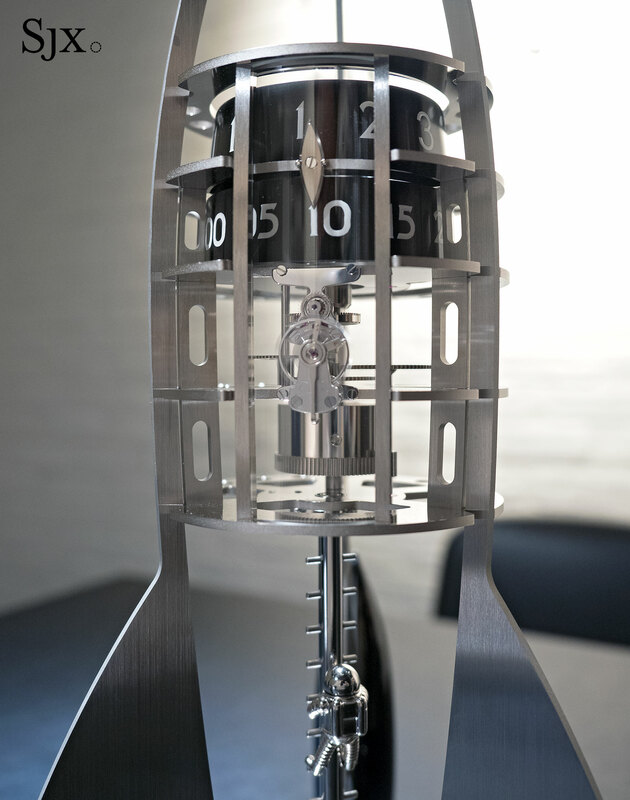 The frame of the clock is a three-legged rocket, with the movement contained within. 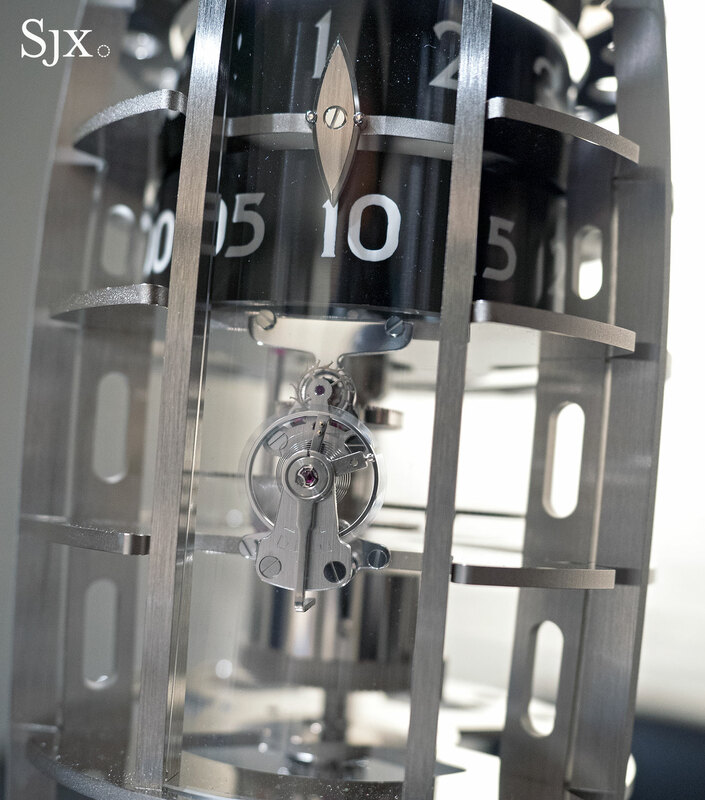 Time is indicated on two rotating drums near the nose of the rocket, with a small crown to set the time located just above the drums. 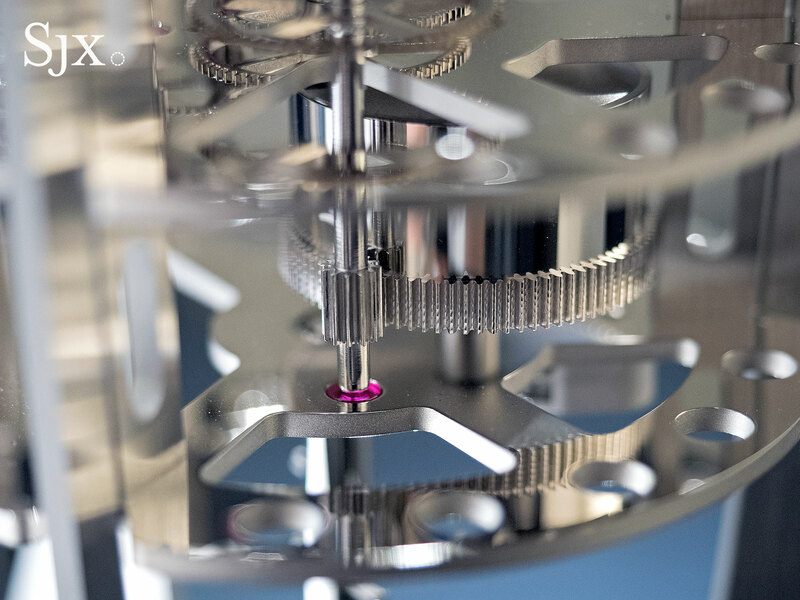 While the form is novel, the movement functions on conventional principles. 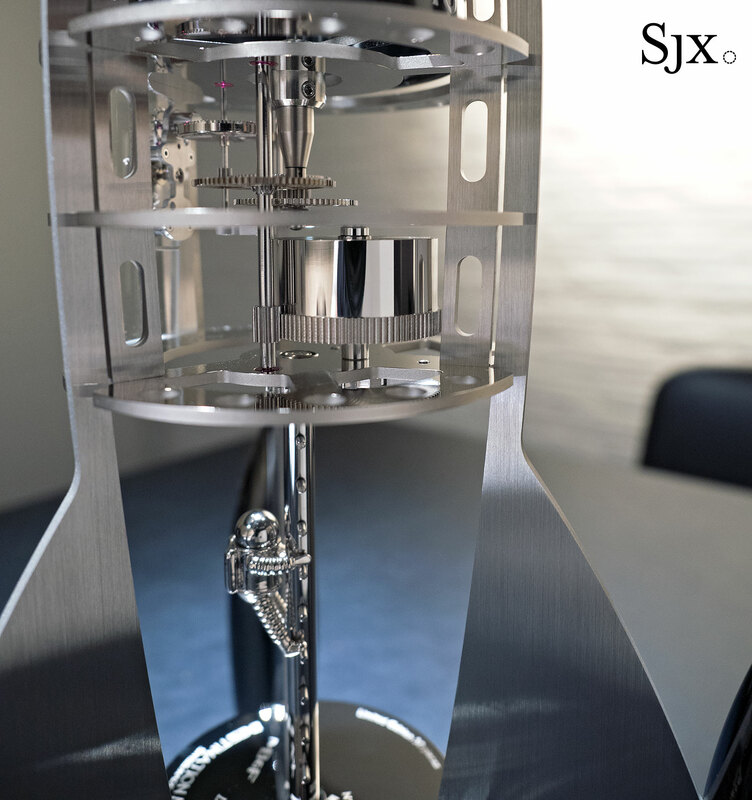 All of the mechanism is open, save for the delicate regulator that’s protected by a narrow pane of mineral glass. 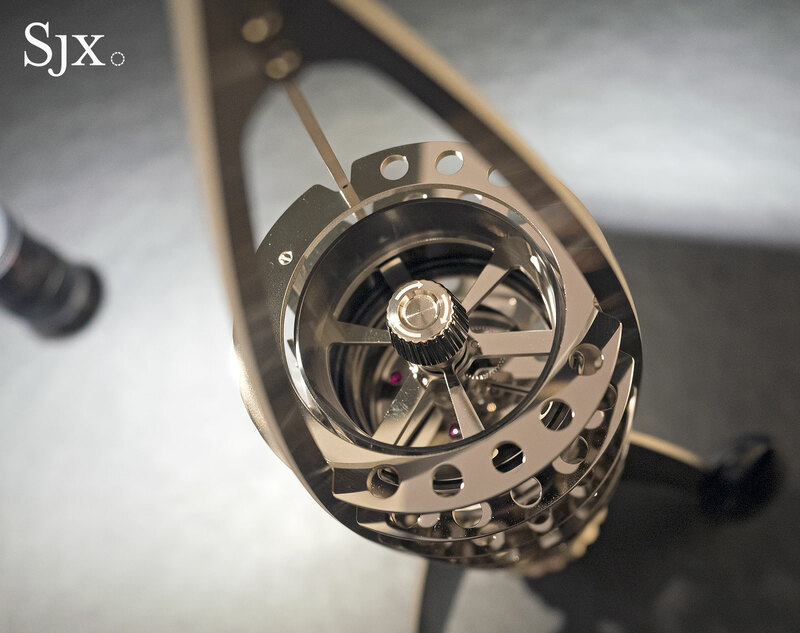 That sits below the time display drums, with the barrel just below it. 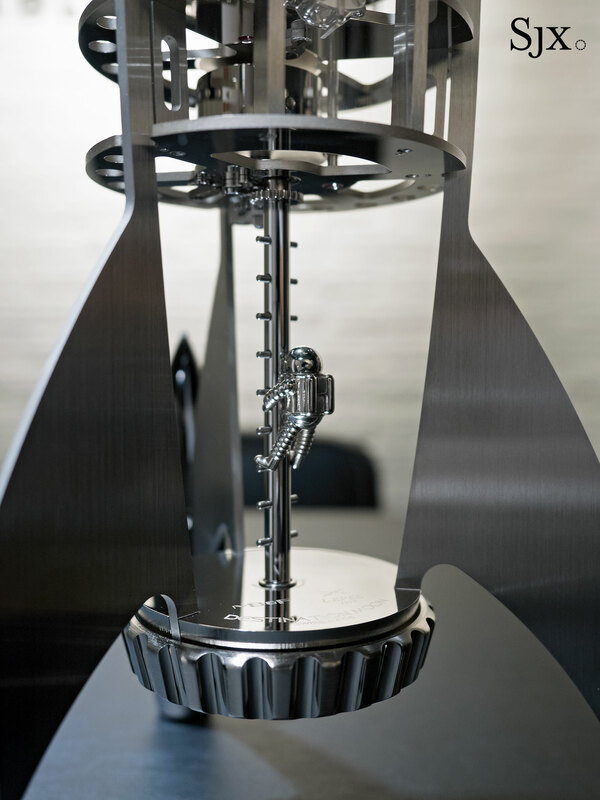 A single, large barrel visible in the mid-section of the rocket powers the mechanism, with an oversized crown at its base to wind the mainspring. And the stem that connects the winding crown to the barrel takes the form of a small ladder, to which Neil can be attached. 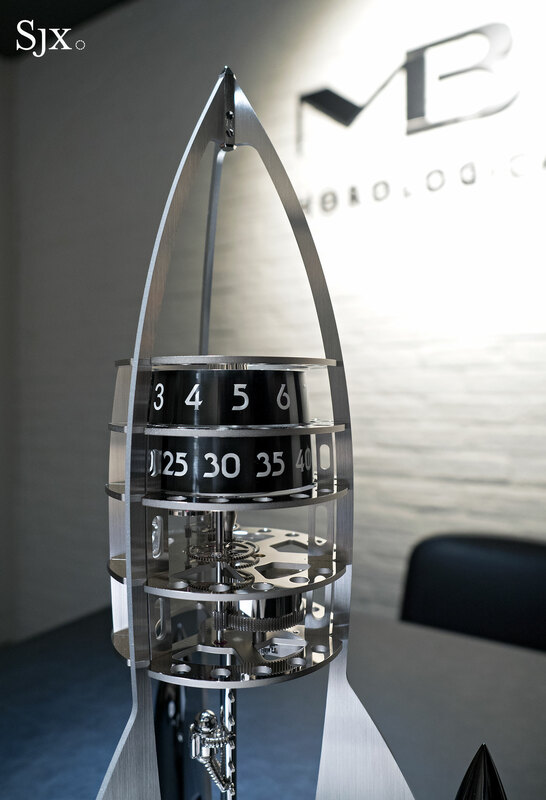 The three pods that form the legs of the clock are available in blue, green, silver or black (pictured here), each in a limited edition of 50 pieces, making for a total of 200. 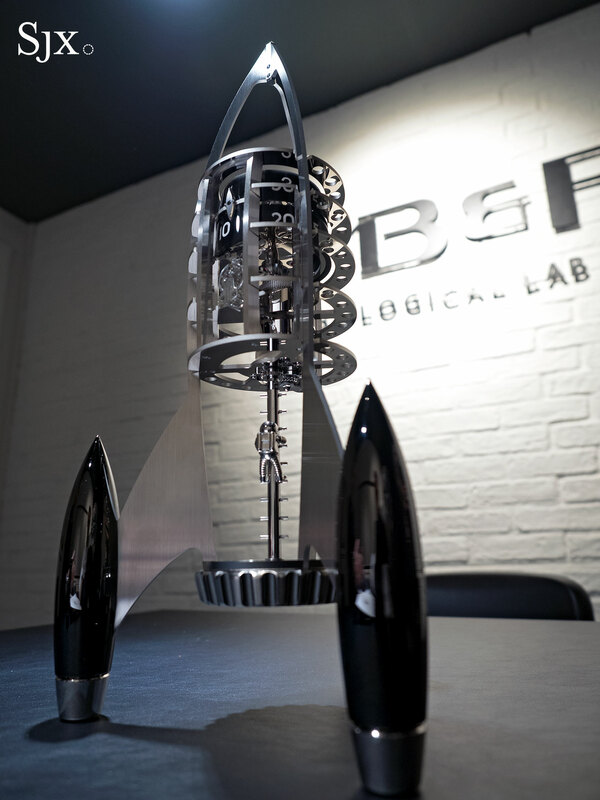 The Destination Moon is priced at SFr19,900 before taxes and is available at MB&F retailers and M.A.D Galleries.